I love vintage and like to add something vintage or antique to every room. My colors are usually neutral, so I add in touches of orange for the fall season. I love being able to change out my colors for each season. I also love to craft, so you'll see some of my creations through the house. 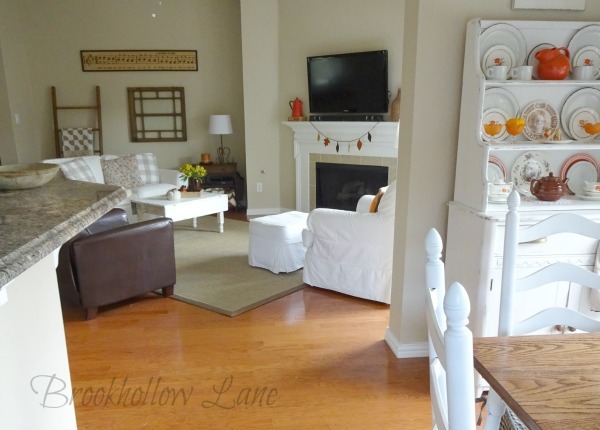 I would say my style is cottage, vintage with a little farmhouse thrown in. In the dining room, I have the table set for a fall dinner. Most of my vintage tableware was picked up at thrift stores. My little bar/wine cart has some orange accents. This is a vintage medical cart on casters. 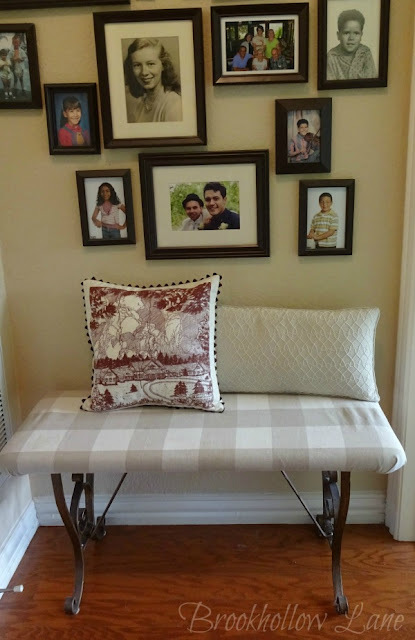 A dead end hallway where I made a vintage tea towel into a pillow. Come on in to the family room. I have an angled fireplace, so I have angled the furniture to match. I have kept the fall decor to a minimal look. Just touches here and there. Quilts and throws warm up the room for the cooler nights. Lovely pumpkin made by talented Celestina Marie at Southern Day Dreams. There is Bowie-he loves to photo bomb my pictures. I love this plaid throw with the brown and orange. A little wooden puzzle piece to add a dash of orange. I love using baby pumpkins to decorate! Pretty table runner(shawl) found at Good Will. A little wool leaf garland that I stitched up. You can see that the breakfast area opens right into the family room. I keep the color scheme going into the kitchen. Ready for a cup of coffee? The kitchen hutch is decked out for fall with mostly thrifted stuff. 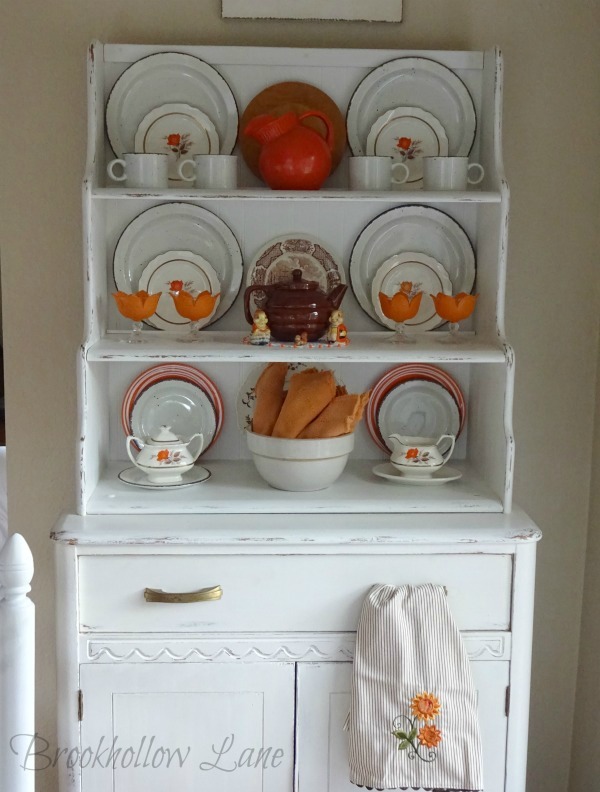 More on the kitchen hutch here. I hope you have enjoyed my little tour. I sure enjoyed having you visit. 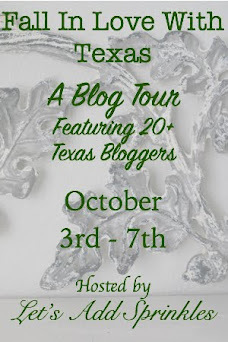 Please go and check out these Texas bloggers and see how they have decorated their homes.Thank you Katie from Let's Add Sprinkles for putting this tour together. Your home looks delightful for fall! I love the leaf garland and vintage tea towel pillow that you made. Your vintage scale vignette is charming, too. I love it! What a fun tour. Your medical cart turned bar cart is my favorite. I love the cozy throws on the white furniture. The hutch in the kitchen is just precious. I'm with you. I like it neutral and then add in pops of color. Thanks for joining our tour. Hi Leslie! Oh, I have so enjoyed seeing your beautiful home with all of your fallen touches! I too love your little kitchen hutch!! Thank you,dear Shelia. I have more fun with that hutch then any other piece of furniture! Thanks for coming by. Happy Fall. Wonderful details you can tell your home is loved. The leaf garland and that white hutch really caught my eye. Thanks for sharing! Good morning, Leslie! You are so smart to keep a neutral background for your furnishings, because changing out for the seasons makes it so perfect! From your welcoming entrance to all around your home, I just love your cottage/vintage/farmhouse style. One of my favorite things was the pretty leaf garland that you made. Seeing Celeste's pretty pumpkin made my smile. Thanks for sharing your home with us. 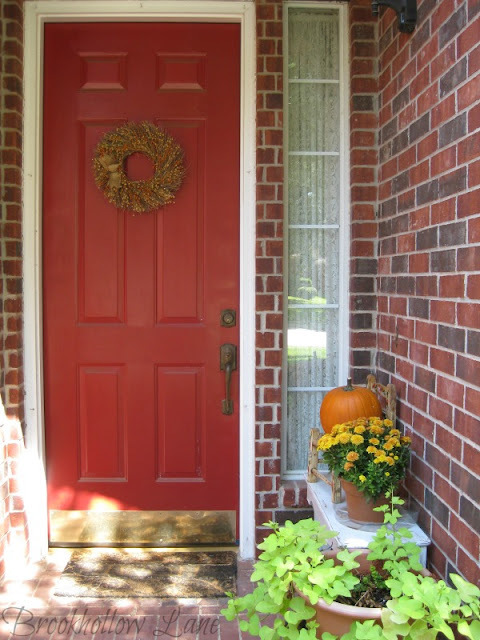 Thank you for sharing your beautiful home decorated for fall. I absolutely love your buffalo check pillows. Where did you get them or did you buy the fabric and make them? Thanks for sharing on the FILWT Blog Tour. Thanks, dear friend. I have ideas milling in my head from all the gorgeous tours. It has been a fun week! Leslie, your home is so warm and cozy and welcoming. I love it that you decorate and make it feel like the season is 'hugging me' and not that your house is just decorated for show. Thanks for sharing! Leslie your autumnal touches are just lovely. 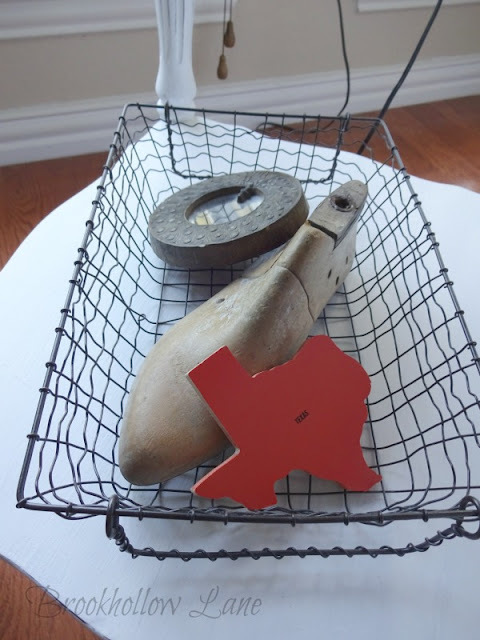 I adore how you incorporate your vintage treasures. The scale and thermos vignette speaks to my soul. Leslie ... 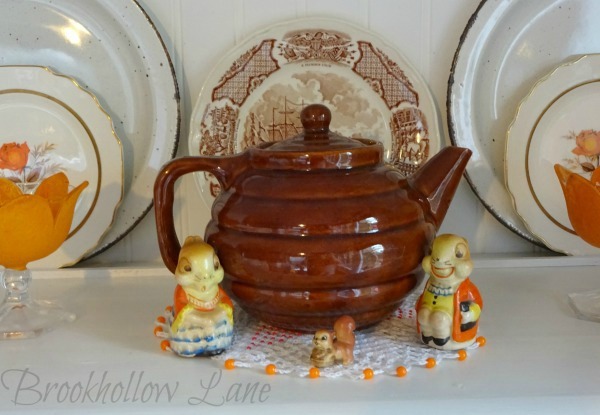 I love how you have included your wonderful thrifted finds so beautifully with your Fall decorations. Love the medical bar/wine cart. Thanks for sharing your interesting home. I love your wool leave garland ~ so sweet! I am crazy about those old plaid thermoses too. I wish they would start making them again. You and I share a love of vintage and I so enjoyed visiting you today. Thanks for sharing your home. Beautiful! Thank you, Deb. We got that the first time we went to Arkansas to visit my parents when they first retired there about 30 years ago. Thanks for coming by! Your have such a beautiful home! I love your white furniture and all your vintage treasures! That plaid thermos is fab! Love all your vintage pieces! Especially loving those plaid look thermos! It all looks very cozy and welcoming! Beautiful! 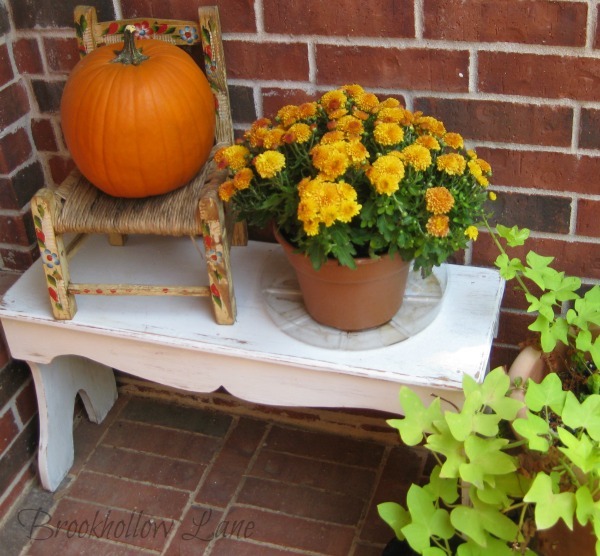 So many pretty fall touches and you have some great vintage pieces! So happy to be touring with you this week! 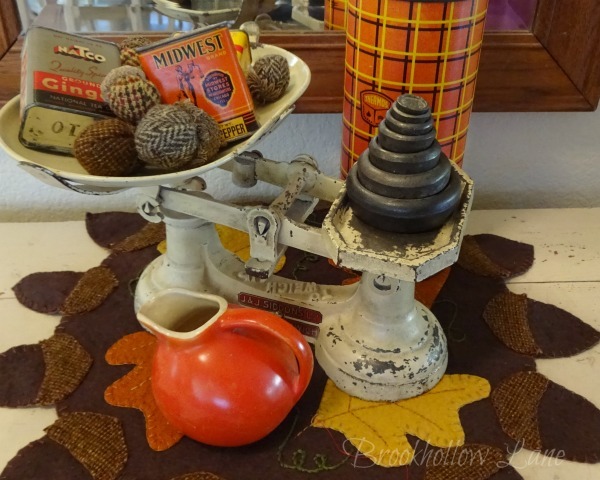 Your vintage pieces really add a special touch to your fall decor... the orange plaid thermos definitely would help warm up a soul on a chilly fall day with some soup. Lovely Fall touches throughout your charming cottage home (I pinned several to my Cottage Style board too) I am smitten with your throws and vintage pieces too. I felt so welcomed, thank you! It has been such an enjoyable tour to share with you! Leslie - It's all so cozy and wonderful. You really have found and made some fabulous pieces. PS. I adore your little bar/wine cart. It's the perfect size! Hi Leslie! I'm enjoying seeing your pretty home and decorations again. I just realized I have a scale like yours but mine is black. I bought it last year in England. 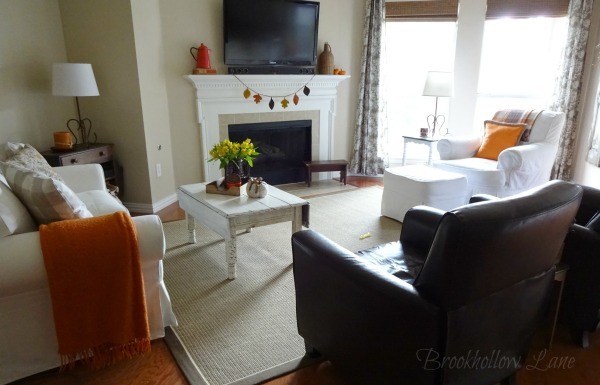 I love the way you've warmed up your white furniture with wool throws and autumn themed pillows. And the leaf garland you stitched up is perfect to string across your fireplace. 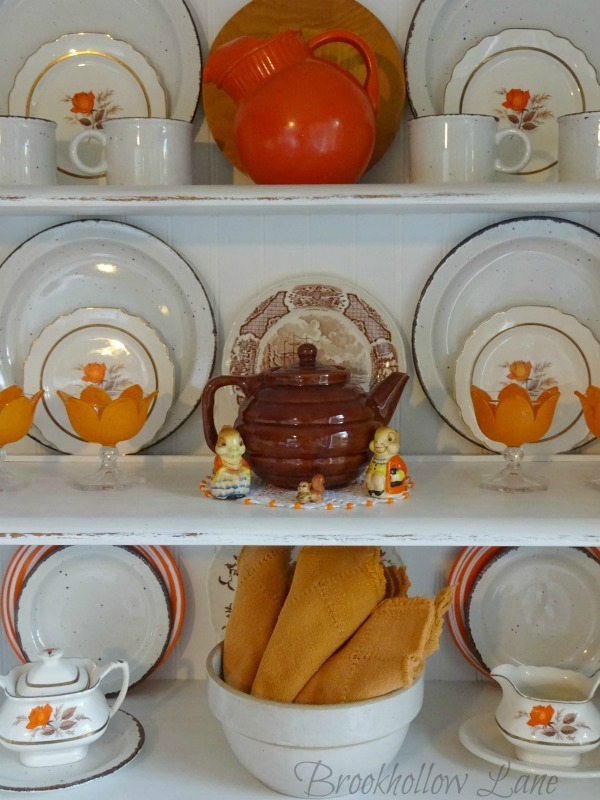 I adore all the vintage treasures you've used to bring seasonal colors into your home, and those salt & pepper shakers in the last photo are absolutely adorable! 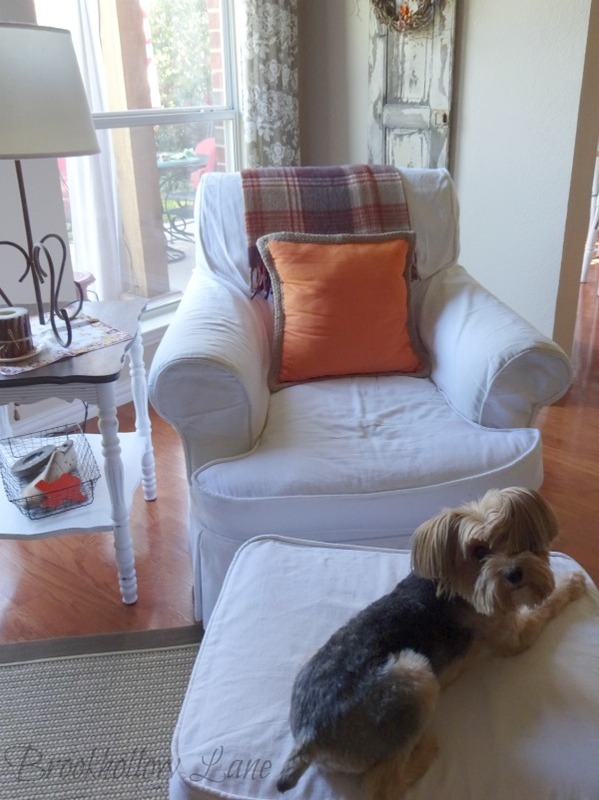 Thanks so much for sharing your home with us, Leslie! Hi Leslie! Everything I pop in and look at your home tour, I notice something else I want to copy! :) Hope you're having a good week and thank you for popping in to see me. Thanks, Shelia. You are a sweetie for coming over here again! Hope you are having a wonderful weekend!